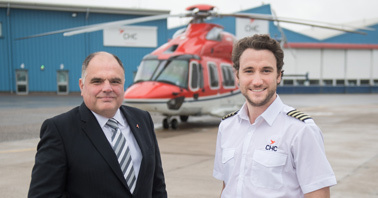 Aberdeen International Airport and CHC Helicopter have announced their collaborative Runway Run which will be taking off this summer. Captain Ryan Broadhurst is hoping to see around 300 participants take part in the new charity event which will begin at midnight on June 30. Runway runs have proved popular at other airports around the world and runners taking part in the Aberdeen event will run two lengths of the runway which equates to a 3.5 km run. Ryan is hoping to raise thousands of pounds for good causes, including CHC’s charity Veterans with Dogs. All participants will start at the same time and complete two lengths of the lit runway. Transponder chip technology will be used to accurately time each individual. The results will then be displayed in the CHC terminal at the airport once the runway has been vacated. Runners can take part as individuals in the Fun Run or enter as part of a team of 12, with all the times aggregated in the Team Marathon, with the fastest teams winning prizes. It costs £25 per runner to take part, with each runner required to raise a minimum of £100. Prizes include a flight in a CHC Helicopter aircraft to the top five highest fundraisers. More information and sign up is available at www.aberdeenrunwayrun.co.uk.